At Collapsible Cooler, we believe that good service is offering our customers the best quality and quickest service possible while helping them realize savings and efficiency in their shipping processes. As a small, rapidly growing business ourselves, we understand the passion and energy you invest in your business and want to be your long term cold chain distribution partner. Several hundred collapsible coolers and dozens of gel packs on nine pallets, ready for shipping to customers. Try getting that small footprint with formed coolers! This shipment for 3 customers includes ~100 of our 19x12x12 coolers (just 1.5 pallets). Comparable orders of formed coolers would take more than double the pallets. 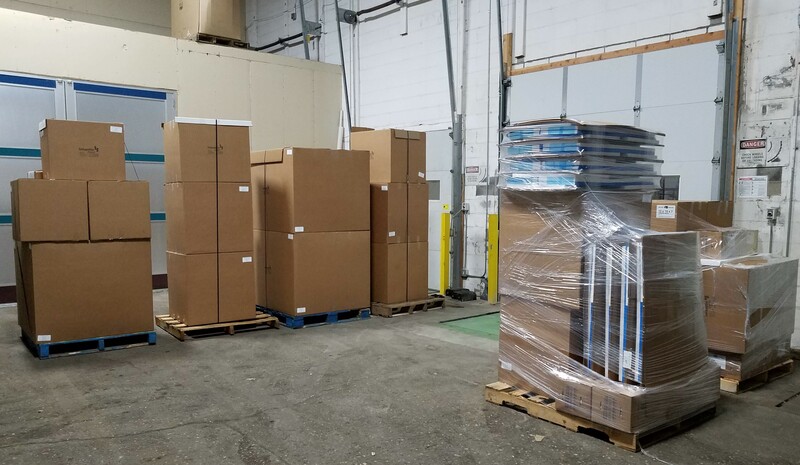 Minimizing our shipping footprint by packing more coolers into each parcel or pallet reduces the overall carbon footprint of the end-to-end order process. Recycling is very important to us, which is why 100% of our recyclable waste EPS material is returned to the manufacturer for reuse. Want to recycle your EPS materials? Click the button below to locate recycling or mail-in locations near you.